If your little one is left-handed you are probably already familiar with the common problems of smudged work, bad posture and aching hands as your child tries to develop their writing skills. A new ergonomic training pencil, the Stabilo ‘smove easyergo has been launched by left-handed specialists www.anythingleft-handed.co.uk specifically to help left-handers learn the correct grip from the moment they begin to practice writing. •	Specific moulded grooves for little fingers guide the left hand naturally into the correct grip for better control. •	This grip brings the hand below the writing line, alleviating smudging. •	This position gives easy, comfortable handling preventing muscle fatigue. •	A clear view of the writing line means improved posture and more efficient letter formation. •	Refillable – packs of 6 refills available. 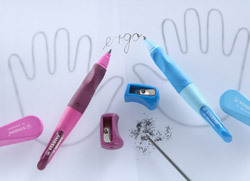 The Stabilo ‘smove easyergo comes in blue or pink, price £4.99 (including refills and sharpener) in both left and right handed versions, available online from www.anythingleft-handed.co.uk who stock all the tools for school including rulers, sharpeners, writing practice books, geometry sets and of course scissors in properly designed left-handed versions you won’t find in the High Street. www.anythingleft-handed.co.uk or tel: 0845 872 3272 for mail order. •	Anything Left-Handed provides left-handed products worldwide, through its website www.anythingleft-handed.co.uk. It is the leading supplier of left-handed products in the U.K. and Europe. This award-winning website is also a huge source of advice and information on all topics relating to left-handedness. •	The products range from the traditional left-handed scissors and kitchen implements, through a host of knives, stationery and computer peripherals to some funky and innovative left-handed pens – there’s even a left-handed boomerang! •	The company is owned by the Milsom family, who have been involved in the business for the last 20 years. The directors of the company, Keith and Lauren Milsom, are both left-handed. They also run the Left-Handers Club. •	Lauren Milsom is a leading expert on handedness. She has worked with left-handed children for over 20 years and is author of "Your Left-Handed Child” published by Hamlyn 16th April 2008. ISBN 978-0-600-61480-7. Available online from www.anythingleft-handed.co.uk RRP £9.99 (+p&p) and from all major bookstores. 128 pages full colour. This press release was distributed by ResponseSource Press Release Wire on behalf of Anything Left-Handed in the following categories: Children & Teenagers, Women's Interest & Beauty, Education & Human Resources, for more information visit https://pressreleasewire.responsesource.com/about.